Revitalize your skin with TCR’s skin therapy! Pamper your skin at TCR! Beyond a relaxing massage or a good rest, your skin needs some tender, loving care. Rejuvenate your skin with any one of our incredible scrubs and wraps to make sure your whole body feels great, too. Experience an Organic Body Scrub, Anti-Cellulite Wrap, or a Detoxifying Seaweed Wrap. And don't forget to add an extra indulgence such as a Scalp Massage or Rejuvenating Hand Treatment. Experience the special treatment of naturally refined sea salts and essential oils, blended together for the ultimate body exfoliation. TCR’s Body Scrubs remove dead cells, impurities, and sebum, thus speeding cell renewal, and allowing smooth, new skin to shine. Choose Lavender, Peppermint, Oatmeal, Chocolate or Brown Sugar. This full-body treatment is designed to remove toxins, reduce water retention, and diminish the appearance of cellulite. Essential oils are combined with a heated wrap to improve the skin’s elasticity and suppleness, minimizing fatty deposits, and leaving skin firmer, toned and more luminous. Maximize results with a series of 5 treatments. This rejuvenating treatment includes gentle exfoliation and a warming, mineral-rich, full-body algae wrap. Micronized algae eliminates toxins and impurities, stimulates cell exchange, and reinforces the capillary layer, leaving skin soft, supple, and toned. 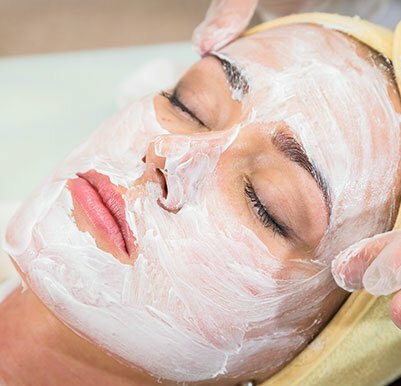 Explore our rejuvenating and revitalizing facial options here!